Why hello there Cottage Fix crew! 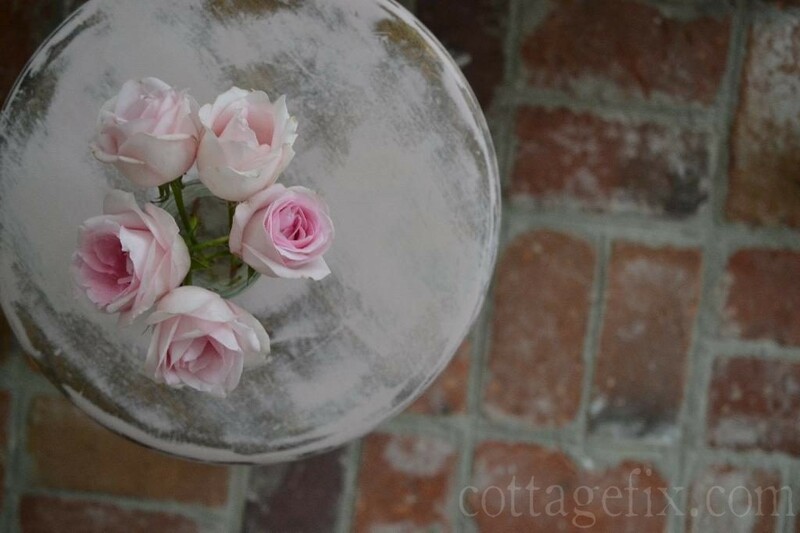 I’m blogging in today with another chalk paint project, this time in a lovely shade of pale pink. 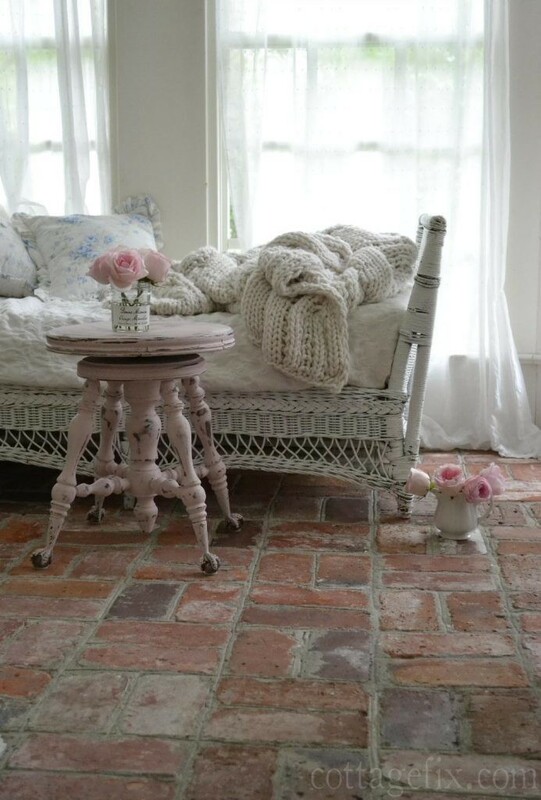 It’s the softest quietest shade of pink called Antoinette by Annie Sloan. I also used this color on my heirloom dresser last year and loved how it turned out. So I was sort of dying to try something in this shade of pink for downstairs. This little piano stool was the lucky winner! Grin. Just like most of my furniture painting projects, I started with two coats of chalk paint and then went in with the sander after the paint had dried. I went a little overboard with the sanding this time and ended up adding more paint in a few places before I waxed. This piece has two coats of clear wax for a pure pink color and smooth finish. 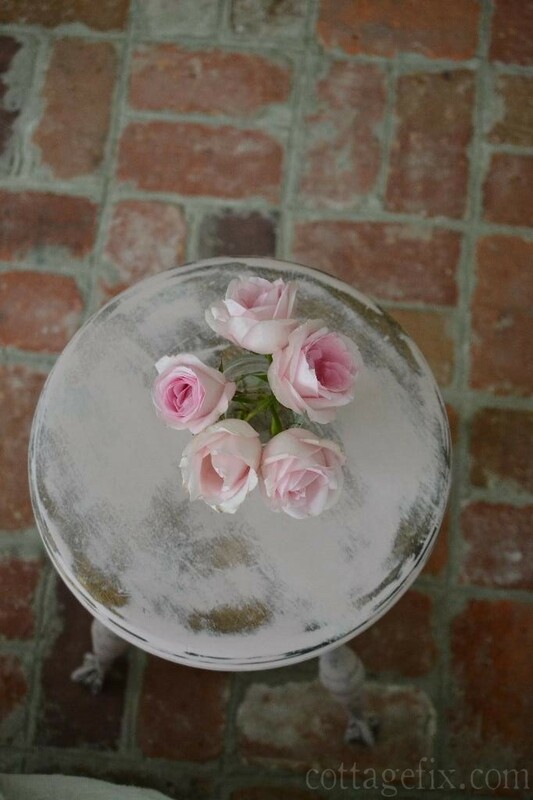 Along with the pale pink roses this Antoinette painted stool is adding a dose of shabby chic goodness to our sun porch. This super feminine look is always fun for me to play around with. I must admit, the pink hue also adds a bit of warmth that’s been lacking from this space. Sometimes I get so stuck on the blue/gray side of the color wheel that I forget how much I enjoy venturing over to the other side. Such a rebel, right! 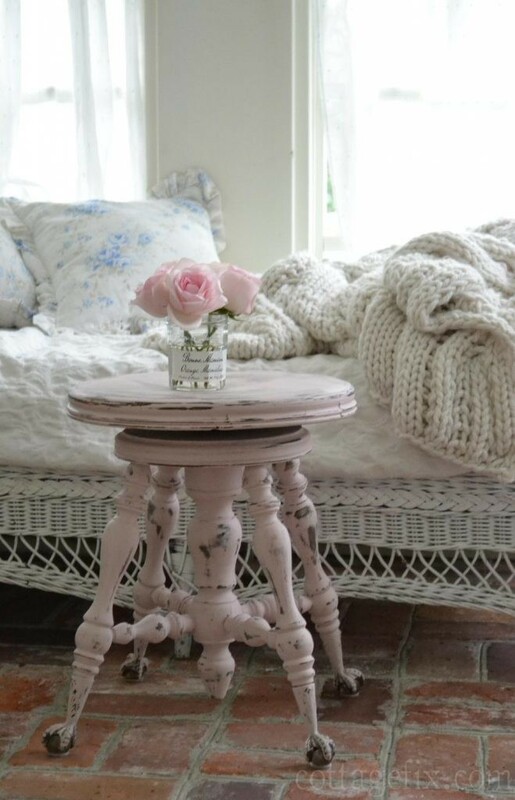 I’m planning on using this little pink piano stool in the family room for a side table. 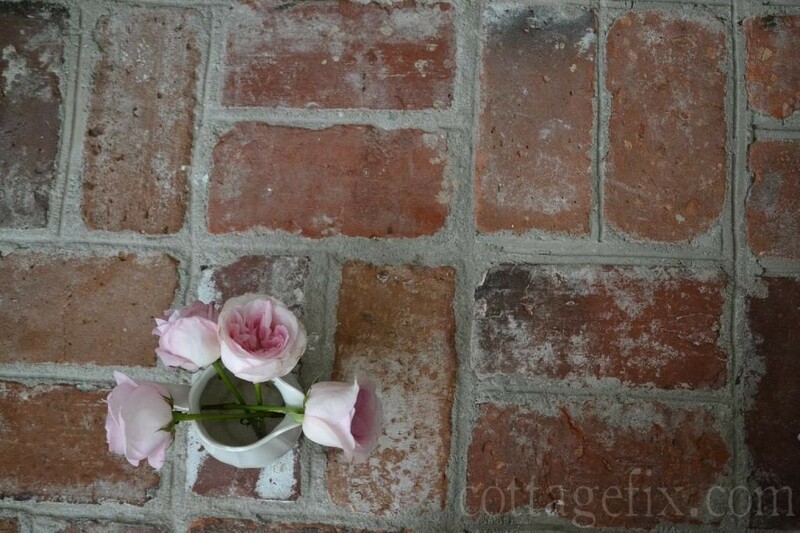 I decided to photograph it in here because I thought the pink looked so pretty against the brick floors and the family room is in need of a good tidy up. It might just find a permanent home on the sun porch though, we’ll see. I’m trying to decide on one more painting piece before I hang up my brush for a while. This entry was posted in cottage makeovers and tagged color, cottage, decorating, furniture, paint, shabby chic on August 3, 2016 by sally. 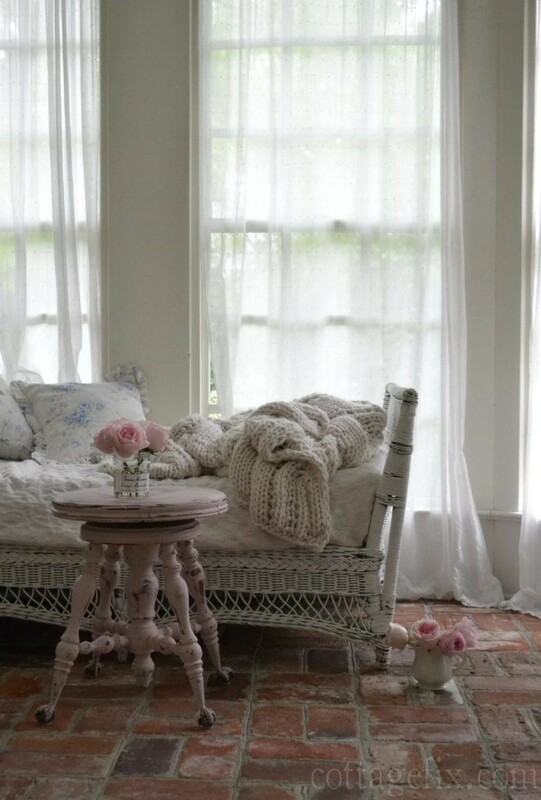 Oh, I love how this turned out…so soft and pretty! What an adorable little stool that is! I love the pink that you chose, it’s very soft and subtle:) I have some pink but, like you, I do tend toward blues and grays more. I was on a huge lavender kick for a while but may have burned myself out on that color a bit! It’s always fun to give something new life with a bit of paint tho! that is the perfect shade of pink! I love how you distressed it too. That is the prettiest piano stool. I’ve seen those in antique stores before and love the shape of it. That’s a good idea to use it like a little side table. The pink does warm up the cooler colors. It is such a quiet, pretty shade. Those roses are just gorgeous! 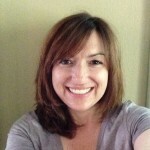 Hi Sally, love your pictures, what a cozy cottage you live in!!!! 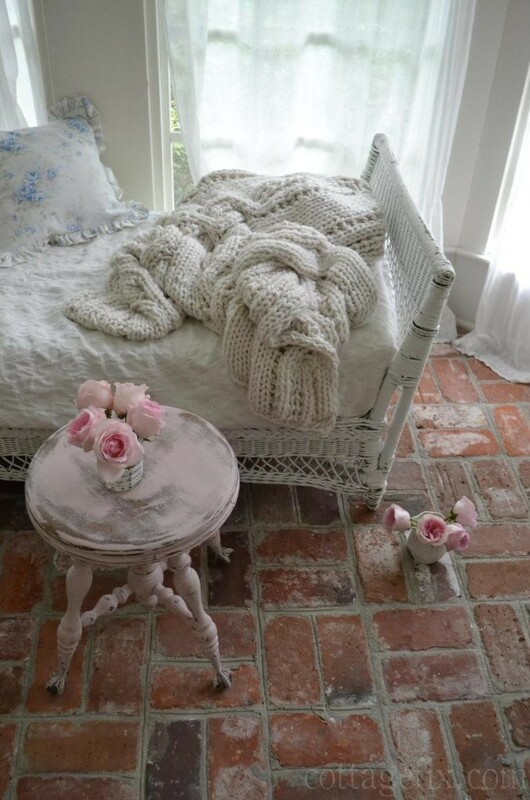 Can I ask you where you found that gorgeous knitted cream colored throw blanket?? ?